The Fraser Suites Sydney - Sydney's first all suite 5 Star luxury hotel accomodation, designed by internationally renowned architects Foster + Partners. The Fraser Suites are perfectly located in the heart of Sydney?s vibrant shopping and entertainment precinct and within immediate reach of major corporate headquarters. From the moment you enter the striking foyer with its spectacular 6-metre rainfall chandelier, you will experience the warmth of our welcome and the graciousness of our service. The Fraser Suites Sydney is close to everything that Sydney has to offer and features numerous guests facilities including business centre, conference centre, direct internet access, disabled facilities, faxing facilities, gym & fitness equipment, lift, restaurant, room service, sauna, secretarial services, spa, indoor pool, 24 hour reception, babysitting service, daily housekeeping and express check in/out. Fraser Suites Sydney, just 20 minutes by taxi from Sydney's Kingsford Smith Airport, is the ideal luxury 5 star Sydney apartment style hotel, offering a fresh new design and a new level of luxury, space, convenience and lifestyle facilities befitting discerning business and leisure travelers. Our satisfaction is to provide a home away from home where you are treated as part of the Fraser's family and feel much more than just a guest. Nearby Attractions : Whether you are doing business or enjoying deserved vacation time, the superb location of Fraser Suites Sydney in the heart of the city will enhance your stay in Sydney. The best of dining, shopping, entertainment and the leading businesses in Australia are all virtually on your doorstep, Fraser Suites is a short stroll from numerous restaurants and nightspots situated along the waterfront at Cockle Bay, minutes from Darling Harbour, the Spanish Quarter, Chinatown, Queen Victoria Building, Galleries Victoria, Pitt Street Mall, St Andrew's Cathedral, the historic Sydney Town Hall, Hyde Park, and Sydney Tower to name a few. Public transport is available from Town Hall Station, just 3 minutes from the doorstep, and buses run regularly along George Street around the corner. The best in retail therapy is only minutes by foot David Jones and the exclusive boutiques on Castlereagh Street beckon. For theatre and concert goers the Capital and State are within easy walking distance, as with the Sydney Entertainment centre on the fringe of Chinatown. 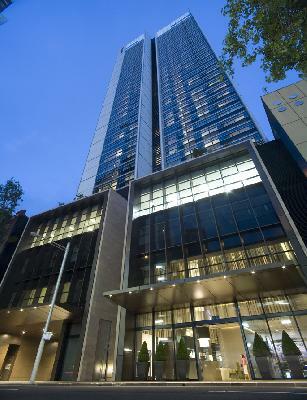 Sydney's finest restaurant, the multi-award winning three hat Tetsuyas is situated directly opposite Fraser Suites. Our knowledgeable guest service team are on hand around the clock to assist with directions, bookings and general sightseeing information to make your stay in Sydney a memorable one. 1 Bedroom Deluxe Suite : Sleeps up to 3 guests on 1 Queen Or King Bed Or 2 X Single Beds Upon Request. 1 Bedroom Premier Suite : Sleeps up to 3 guests on 1 King/queen Bed. 2 Bedroom Deluxe Suite : Sleeps up to 5 guests on 1 King/queen Bed + 2 Single Beds Or 2x Queen/king Beds. Studio Queen/Twin Hotel Suite : Sleeps up to 2 guests on 1 Queen Bed Or 2 X Single Beds Subject To Availability .